Mayor Michael A. Nutter has announced that Philadelphia develop a Bike-Share System that will enable Philadelphians, commuters and visitors to check out iconic, sturdy bikes from a self-service docking stations and drop it off at another station. With this announcement, Philadelphia joins 42 other cities in North America which either have, or are planning to develop, bike-share systems. 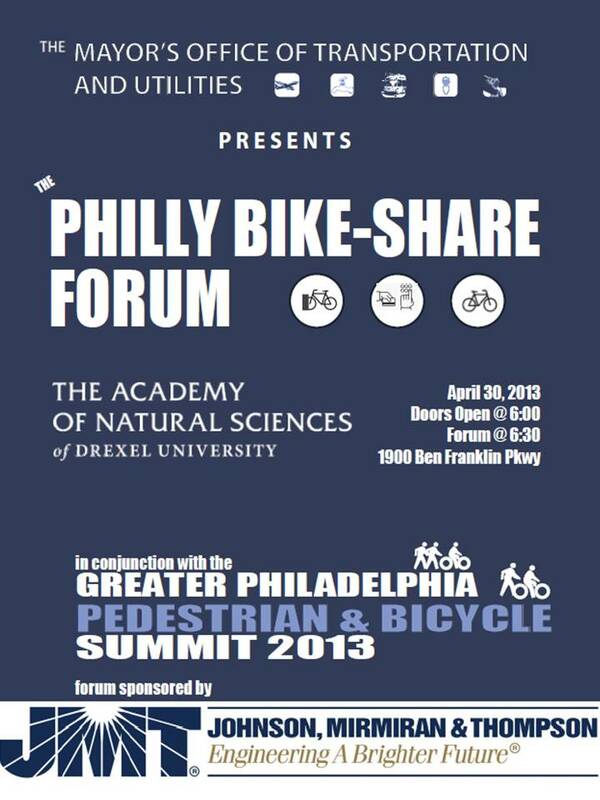 Please join The Mayor’s Office of Transportation and Utilities (MOTU) on Tuesday April 30th at 6:30 (doors open at 6:00) in the evening to hear presentations from the architects of some of the nation’s best bike sharing systems, hosted by the Academy of Natural Sciences of Drexel University. Come hear representatives from Boston, Denver and Washington DC discuss their experiences developing, launching and operating bike sharing systems in their cities. The forum will conclude with a brief presentation on the City of Philadelphia’s plans to launch a first-class bike sharing system by the end of 2014. The forum is made possible with the support of the William Penn Foundation, Pennsylvania Environmental Council and JMT Engineering. Tickets are limited and are available here.